Despite much having been written about what mediation is, direct observations of commercial mediations are limited. This book grants an opportunity to observe mediation in action and also provides external commentary about the actions observed. The book approaches Mediation ethnographically as a social process that is informed by structures, rules and norms that colour the environment within which it operates. Through the ethnographic method, a process leading to negotiated order is examined, baring its elements, identifying its influences and studying the movement to order. The result is the reconceptualization of mediation. The mediator is invited into the negotiation as third party intervener. He creates the process of mediation, defining the process by his actions, which ultimately merges mediator with process. This book provides a window to the lived experience of participants to mediation: it explores their understandings of and interactions within a process they have experienced together and demonstrates how mediation is a process inextricably linked to negotiation. 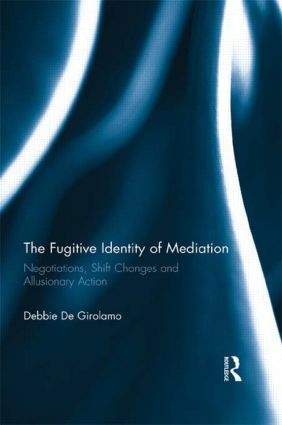 The Fugitive Identity of Mediation will be of interest to scholars, mediators, parties who participate in the process, and to those active in public policy discourse.